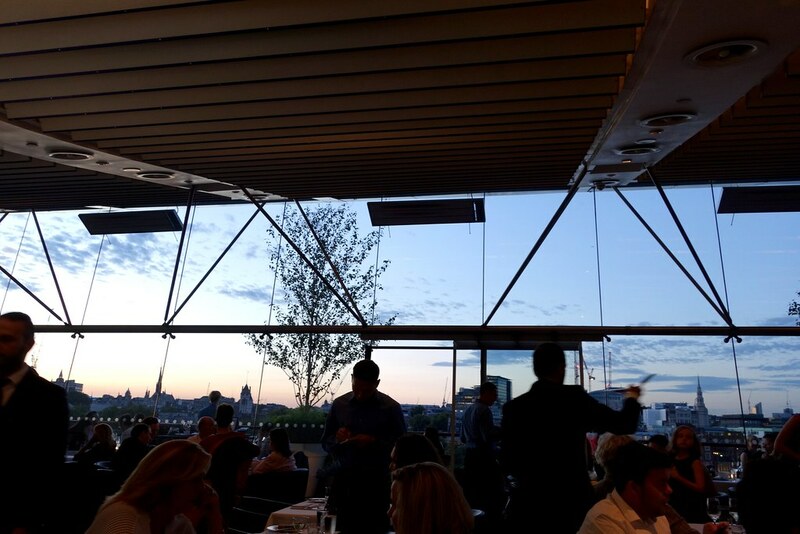 One of the best things about living in London is the food – you can almost any kind of cuisine you fancy, and there are so many quirky, interesting places to discover. Despite dining out a fair bit, I feel like I’ve barely scratched the surface of what London has to offer. Of course, it was absolutely typical that when my Japanese family came to town last week, that I was in a massive panic. Despite the countless number of restaurants in London, I was rushing around like a headless chicken trying to find somewhere that was absolutely perfect. I found all three at the OXO Tower Restaurant. 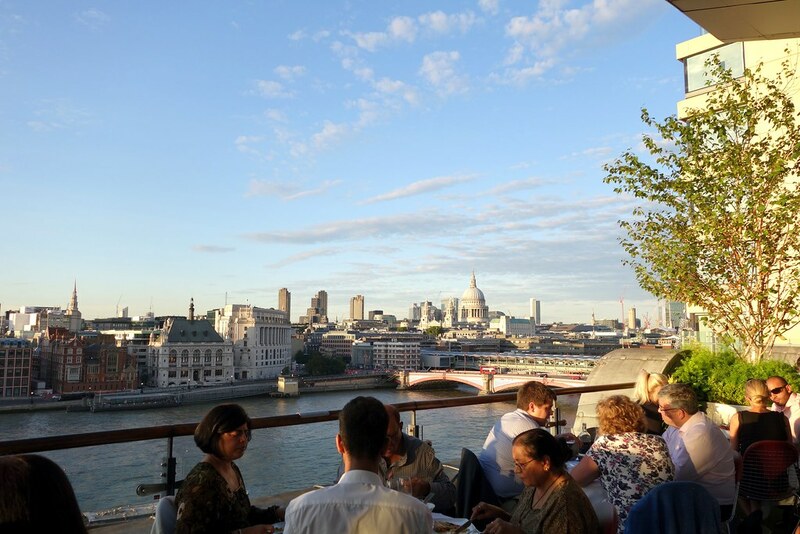 The OXO Tower has been an iconic London landmark since the ’30s, but fell into disrepair until the Coin Street Community Builders, a social enterprise, gave it a new lease of life in the ’90s, when the restaurant first opened. One of the first things to mention is the fact that the view is insanely good. St. Paul’s Cathedral and the Thames in the summer is definitely a winning combination, which kept my extremely snap-happy family thrilled. 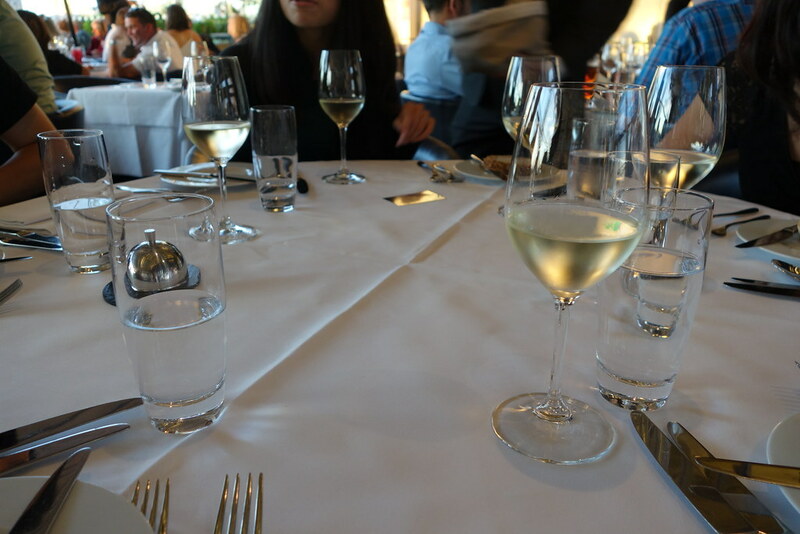 The sommelier chose the wine for us – a lovely white (although I can’t for the life of me remember what it was)! Needless to say all his choices were excellent (and mostly dry, the way I like it). For my starter, in honor of having my Japanese relatives around, I went for the marinated tuna with soy, mirin, sake and cucumber gel. It was beautifully presented, with subtle flavours, although I wasn’t a massive fan of the cucumber gel (I’m not a fan of gels). 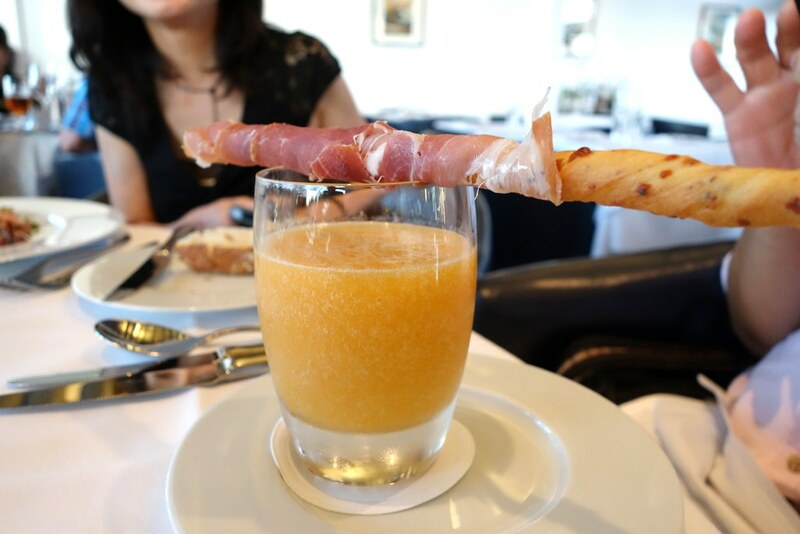 My uncle went for the chilled melon and ginger soup, which was served with Innes sheep’s curd, San Daniele ham, and a black olive parmesan grissini. I thought the choice was rather a brave one – probably not one I would have made. He really enjoyed it though, and liked the combination of flavours – the melon and ham in particular. My biggest regret of the evening was not ordering the starter my boyfriend had – the cured sea trout with baby cucumbers, purple potato blinis, samphire and eggs was really, really divine. 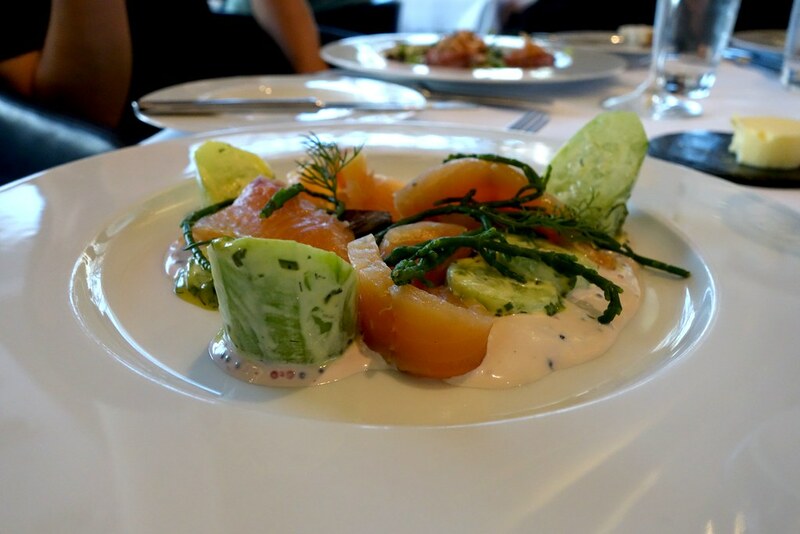 The smokiness of the trout went so well with the freshness of the cucumbers and samphire, while the eggs gave it a stronger depth of flavour – it’s on my list for next time. I opted for the veal sirloin for my main course, which was served with a courgette flower stuffed with ratatouille, baby artichokes and green tapenade. The veal was ever so slightly overdone for my taste, but the courgette and ratatouille was a triumph – something I want to recreate at home at some point! 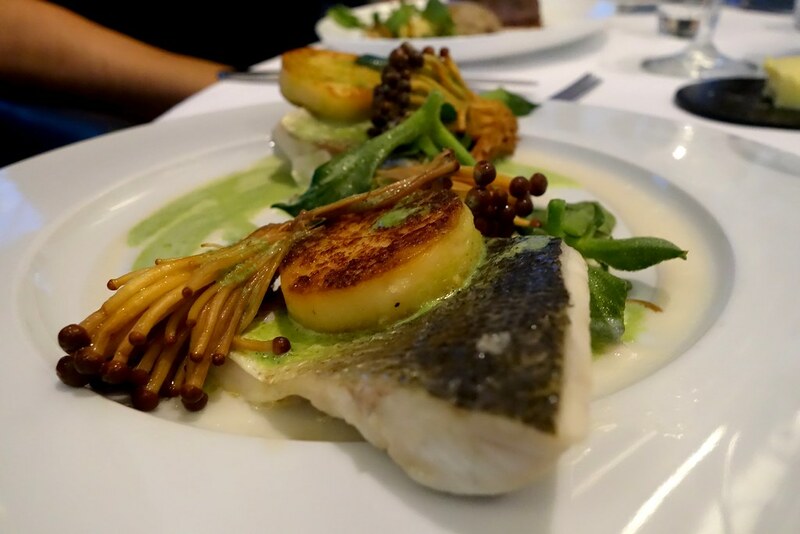 For some reason, everyone else went for the sea bass as their main, which was served with garlic gnocchi, enoki mushrooms, ice lettuce, almond, and sorrel. 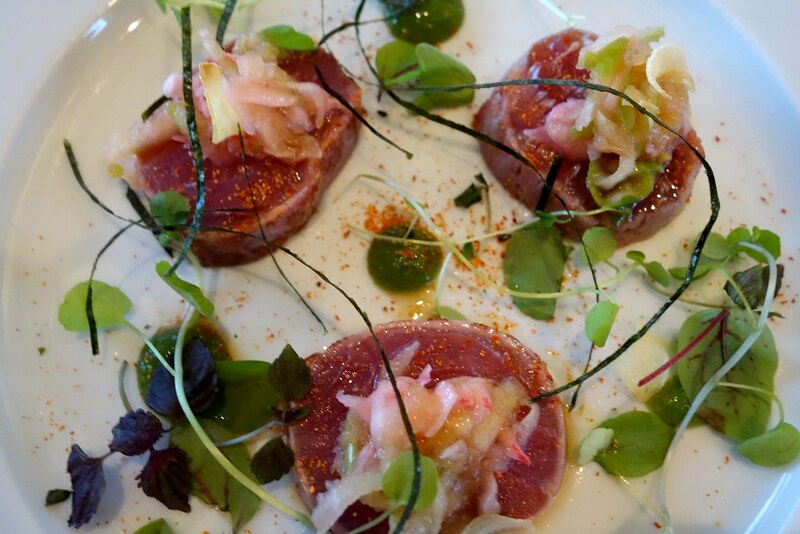 They were onto something though, as they seem to really excel at the seafood dishes at the OXO Tower Restaurant. 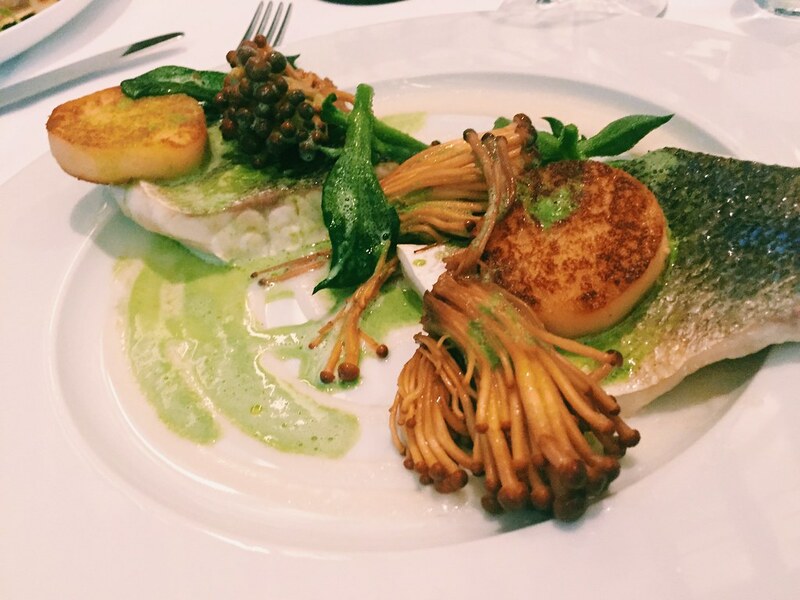 The sea bass was cooked really well, and the rest of the dish tied things together beautifully – the nuttiness of the mushrooms contrasted nicely with the rest of the dish. The meal was slightly let down by the rather odd assortment of desserts. 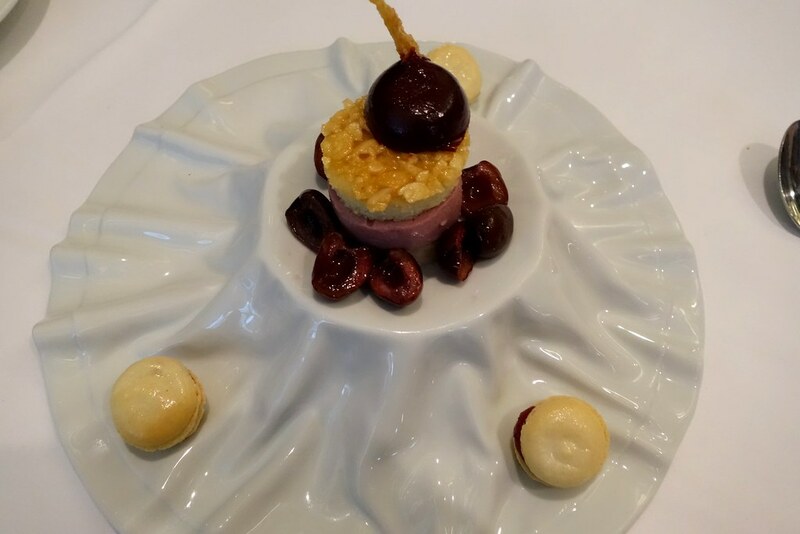 Although presented nicely, my dessert of sour cherry cream served with almond tuile and macarons seemed to be thrown together randomly, and didn’t do anything for me. I would’ve been happy with a larger macaron, and without the odd sour cherry cream altogether. 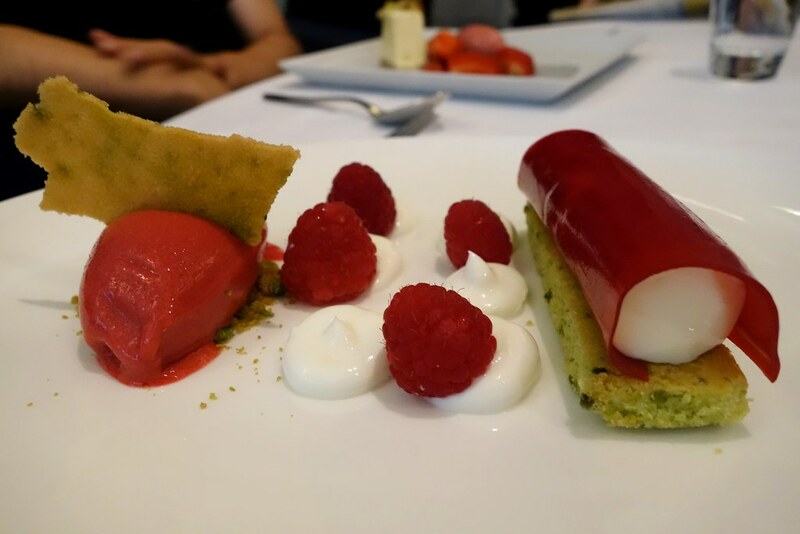 My boyfriend got the raspberry and pistachio pannacotta, which was also presented a bit strangely – in my opinion, the best desserts are always the simplest, and I felt that they may have overcomplicated things by making it more arty rather unnecessarily. 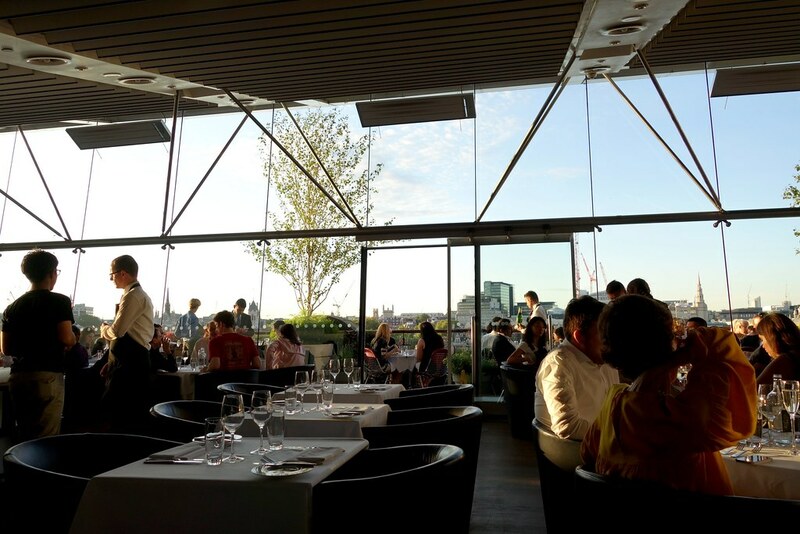 Overall, it was a lovely evening, and I couldn’t have picked a better place for a stunning meal in London. 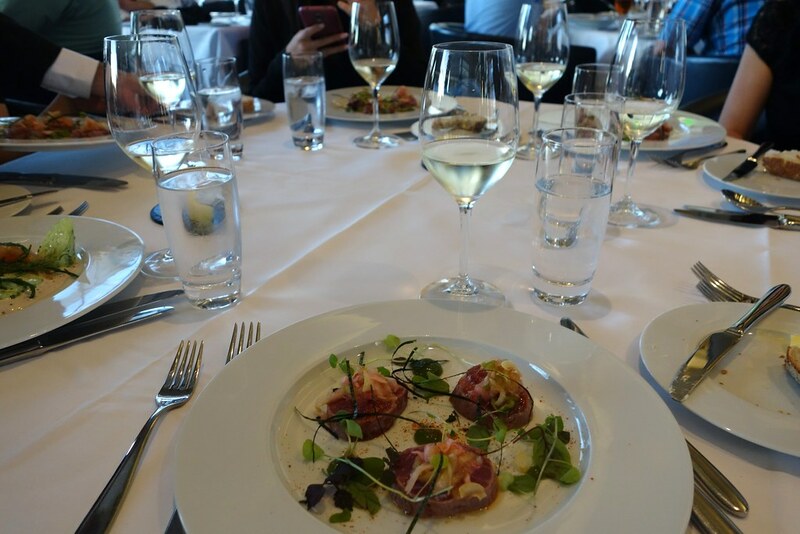 It’s worth even just going to the bar for a drink alone, and my guests really enjoyed it, saying it was the best meal that they had in London. The simple, subtle and uncomplicated flavours were a really big hit, and really suited their palate. 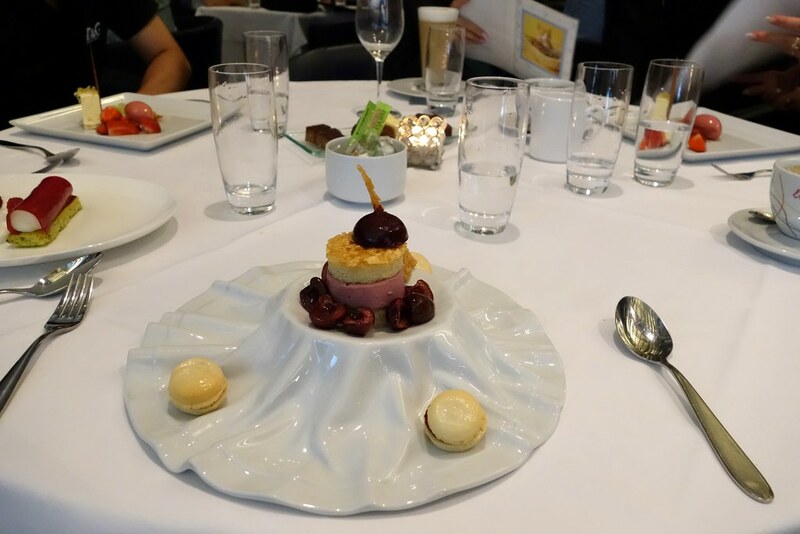 The experience was slightly let down by the desserts, but other than that it was a fantastic meal and I’d definitely be going again! 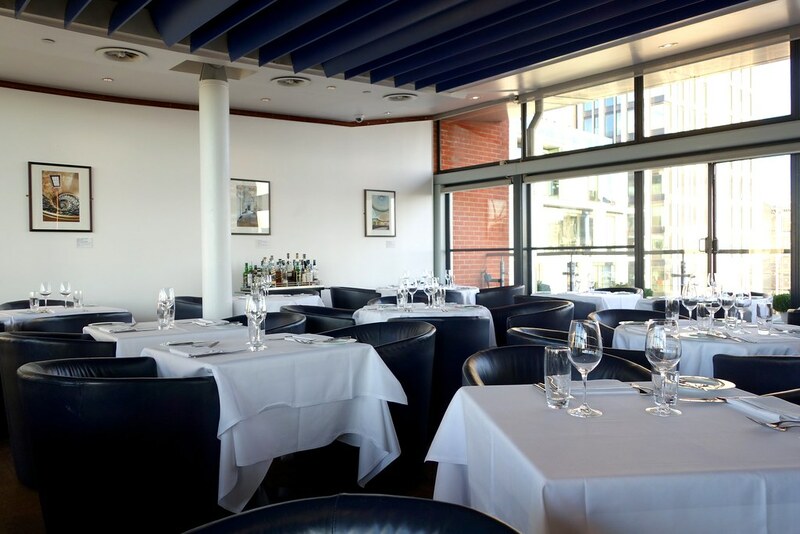 The OXO Tower Restaurant is located on Barge House Street, South Bank, London, SE1 9PH. 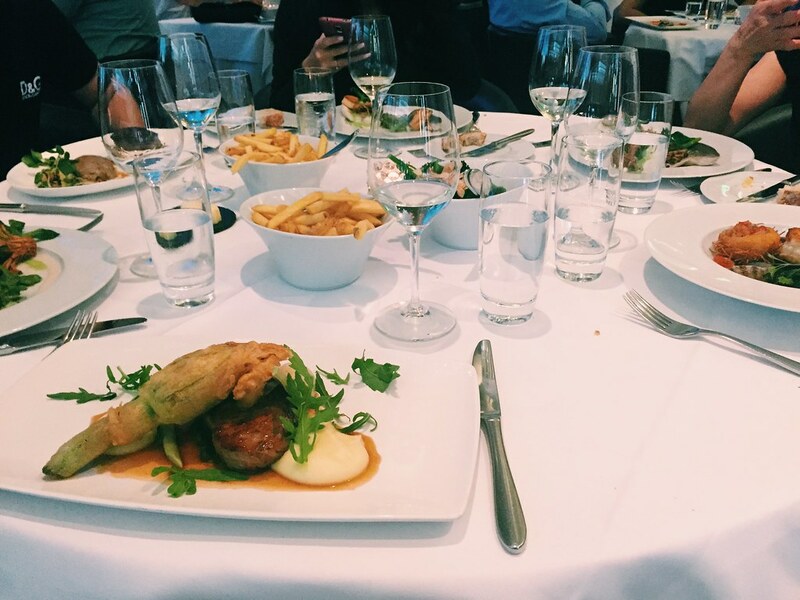 I’ve never been to the OXO Tower but the food looks beautiful!! 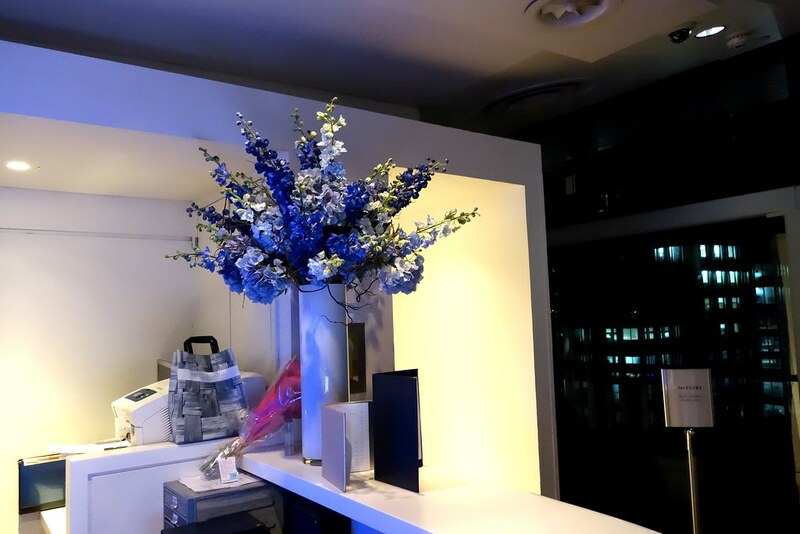 This sounds like a pretty amazing place – I will definitely check it out 🙂 Food looks yummy! Such a nice place to take visitors or for a special occasion, the food is presented beautifully except for your desert, what where they thinking with the crazy volcano like plate? I have never been here before but it looks like the perfect place to celebrate a special occasion. I’m a fan of plates, flat plates not fancy plates and I found the dessert plate utterly bizarre. It would be a great place to spot which way giraffes are going in case of an emergency!